The LUA API for both platform is similar, however this iOS version support more functionality, we will enchance Android version soon. Very nice of you and @Zaniar to share your work, I think I'll need to use this one. Thanks for sharing! @Nascode @Zaniar Big thanks to you guys! do you use Chartboost (or anyone on the forum)? If yes, did it improve your downloads of games? What percent? It looks like serious tool. @fxone I have worked with a few people that got good results with Chartboost and Revmob but it has to fit your kind of game and you need to blend it carefully depending on the place where you display ads (interstitial, banner) and when (startup, on level completed, etc). I don't have numbers to share though. I would advise you to implement and do A/B testing. thanks @Nascode. that is kind of you. I see mention of Revmob. I vaguely remember someone posting a plugin. Is it true? On a side note -not trying to push Revmob plugin here- I've seen very good results with Revmob in terms of Ad revenues so it might be worth a look for your company. 2. even if it's true, I think it was just that his app got tons of downloads and with almost any other ads network/mediation one can achieve similar result. It was from a company who is building social games in Japan and providing services around Line (Yes they seem to get tons of downloads). I saw the revenue pie chart and Revmob had a big share. It seems that when you get tons of downloads, you make more by focusing on advertising companies that bid more than spreading your traffic to lot of little advertisers. I know the article you are referring to, but this is based on what I have seen with two companies. I'm not saying that Revmob is the way to go though, this doesn't prove anything. thanks @Mells and @Nascode. I have experience with Revmob and it does better for me than chartboost at the moment. i've done testing. however i like the overall ad display for chartboost. it depends on the app and audience. @phongtt is this link that you mention above? i had some experience with the revmob from my experience revmob is giving ecpm of around 2-4$(ios only in the android ecpm is much low that i had removed it) please note that i am not getting much download specially for the games in which i have integrated revmob. the main problem in the revmob is it will just give one alert or full screen ad with simple text "want to download a free Game" even in the banner ad it is a same. and also the another problem is sometimes it is out of ad (most of the ad networks which gives this type of ad means download a game or pay per install has this problem) and at that time they serve the ad from other similar ad network which will really decrease the revenue too much. over all from my experience revmob is good for ios but not for android. I know that i'm doing something wrong, but can't understand what. But SDK is in project and chartboost.mm also. 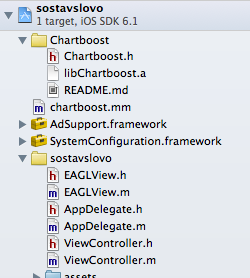 I think you have to include AdSupport framework and charboost.mm into plugin folder.